Independent MP Ahmed Mahloof was released from police custody today, after the high court overturned an ‘unconstitutional’ 15-day detention order and protest ban. 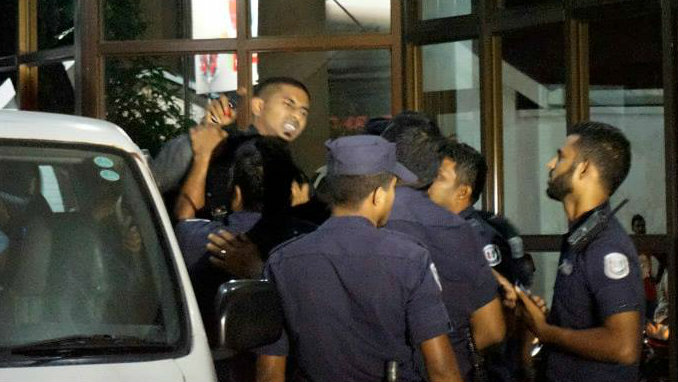 Mahloof was arrested from an opposition protest on March 26 for crossing a police barricade, but since then the criminal court repeatedly re-detained him when he refused to accept a conditional release that would require him to stay away from protests for 30 days. “The High Court said Mahloof can only be held in custody if there is reason to believe he may flee or fail to attend court hearings. Judges said attending protests is not a reason for detention,” lawyers said. 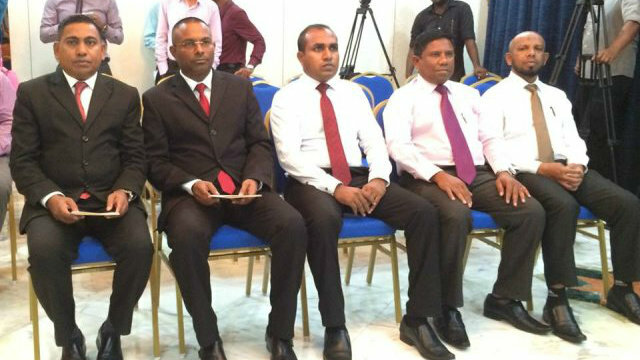 Mahloof, a close associate of former President Maumoon Abdul Gayoom, was expelled from the ruling Progressive Party of Maldives (PPM) in February after he publicly criticised President Abdulla Yameen and the government. He is now part of the Alliance against Brutality, an anti-government coalition, which has been protesting daily over the imprisonment of rival politicians including former president Mohamed Nasheed. Speaking to the press today, Mahloof apologised for campaigning to bring president Yameen to power. “I would like to apologise to the people of Maldives for helping such a brutal ruler assume power,” he said. Human rights group Madivian Democracy Network said the criminal court had released at least 50 protesters on the condition they do not participate in further protests for 30-60 days. Former president of the main opposition Maldivian Democratic Party (MDP) Dr Ibrahim Didi was arrested and held for 15 days last month when he was seen at an opposition protest after having agreed to the criminal court’s conditional release. Dr Didi was released yesterday. Earlier in March, MDP MP Fayyaz Ismail was held for 15 days when he too refused the criminal court’s conditional release. “What we have here are judges who do not know democracy dispensing unconstitutional sentences. But the checks and balances provided in our constitution is simply not working. The JSC refuses to investigate the judges, and the parliament controlled by the government refuses to hold the JSC accountable. Ultimately, the people are denied any form of justice,” she said. Last week, the police denied family visits to Mahloof after they discovered “illegal” areca nuts in his pocket. Mahloof today accused the police of discrimination, saying his lawyers were only allowed to see him before 6pm, while others could see their clients until 11pm. The Judicial Services Commission (JSC) has appointed judges to both the Criminal Court and the Civil Court. According to a statement on the commission’s website, the JSC decided to appoint one judge to the Criminal Court and four judges to the Civil Court in a meeting held last night (February 16). Ahmed Rasheed of Hulhumalé 14-06 was appointed to the Criminal Court while Hassan Faheem Ibrahim from Haa Dhaalu Maukunudhoo, Ali Abdulla (Galolhu ward, Malé), Abdula Naseer Shafeeq (Lhavyani Kurendhoo), and Mohamed Haleem (Noonu Velidhoo) were appointed to the Civil Court. An announcement was made for the application of interested candidates to the vacant positions on the benches of High Court, Criminal Court, and the Civil Court on Feburary 1, 2015. The commission is yet to decide on the appointment of a judge to the High Court bench after the resignation of Judge Yoosuf Hussain – reportedly for health reasons – in early February. The Civil Court has decided “there are no grounds” to grant a stay order asking the Judicial Services Commission (JSC) to halt the process of reappointment of the Hulhumalé Magistrate Court. The order was requested by former President and opposition Maldivian Democratic Party (MDP) leader Mohamed Nasheed, who is challenging the assembly of the bench tasked with trying him for the detention of judge Abdulla Mohamed while in office. In the hearing held yesterday (February 15) at 4pm, the presiding judge stated that the stay order cannot be granted as the court has not found that the JSC is bringing changes to the Hulhumalé Court bench. Meanwhile the Bar Human Rights Committee of England and Wales (BHRC) has expressed concern over the “sudden resumption” of Nasheed’s trial, noting that the committee is closely monitoring the developments. The BHRC said it had closely followed the case for almost two years. Previous observation of the case led the committee to describe the Hulhumalé court bench as “cherrypicked to convict”, prompting calls for “fundamental reform of the judiciary and its administration in the Maldives”. In answering Nasheed’s stay order request, the JSC has previously denied that it is bringing any changes to the court, also claiming that it does not currently exist as the two out of three of the magistrates first appointed have now been promoted to superior courts. Saturday’s trial saw the JSC raise a procedural issue, stating that while the commission has the authority and power to allocate and transfer judges, the Civil Court does not have the jurisdiction to deliberate on the legality of the Hulhumalé Magistrate Court bench as the bench was appointed on the Supreme Court’s advice. The JSC lawyers also contended that the decision was not made by the Judicial Council as claimed by Nasheed’s lawyers, as the responsibilities and authority of the council have been taken over the Supreme Court. Nasheed’s lawyers asked whether the JSC is claiming that the Civil Court cannot deliberate on the matter because the commission interprets the Supreme Court’s advice on appointing the bench as a court ruling or because the JSC does not believe Civil Court has jurisdiction on the matter. The JSC lawyers responded by stating that the “procedural issue is based on Supreme Court’s decision”. In Nasheed’s challenge at the High Court regarding the legality of the Hulhumalé Magistrate Court bench, the JSC raised a similar jurisdictional issue, with the High Court deciding that it did not have jurisdiction to look into the matter, saying it could only deliberate on decisions taken by lower courts. In reply, Hisaan Hussain from Nasheed’s legal team explained that Article 43 (C) of the Constitution afforded every citizen the right to appeal against any administrative decision and that “therefore we are appealing JSC’s administrative decision to convene the magistrates panel”. Subsequently, the JSC clarified that the procedural issue was based not on jurisdictional grounds but because the commission believes that the Supreme Court’s advice on appointing the Hulhumale’ Magistrate Court bench is the court’s ruling. At that point, the presiding judge stated that the Supreme Court had issued a circular that “changes the composition of the Civil Court by 12am tonight (by 15th February)”, explaining that “I cannot assure you that I will be sitting on this appeal after the said changes; therefore I cannot give out court summons for the next hearing. Nasheed’s legal team also requested more time to discuss the case with the legal team and lawyers based outside Maldives. The controversial court was formed specifically to oversee Nasheed’s trial for the January 2012 detention of Criminal Court Judge Abdulla Mohamed. Legal challenges to the court have seen the case stalled since April 2013. United Nations Special Rapporteur on the Independence of Judges and Lawyers Gabriela Knaul has also noted that the “appointment of judges to the case, has been set up in an arbitrary manner outside the parameters laid out in the laws”. Former President and Maldivian Democratic Party (MDP) leader Mohamed Nasheed’s case against the legality of the process in which the bench of the Hulhumalé Magistrate Court was heard by the Civil Court today. Nasheed submitted the case to the lower court after the High Court decided on Monday (February 9) that it could not deliberate on the legality of the bench, citing jurisdictional grounds. The High Court’s decision read that, under the regulation, the court can deliberate on decisions of the lower courts, but not on their composition. According to Nasheed’s legal team member Ahmed Abdulla who spoke to the press outside the court, the trial today heard the case challenging the legality of the Hulhumalé Magistrate Court bench and also a stay order requested by Nasheed. “We have received information the Judicial Service Commission plans to bring changes to the bench, we requested the court to order a halt to that”, Abdulla said. He added that the JSC’s legal team requested more time to respond to the case regarding the legality of the bench but that it had responded to the stay order request. “Firstly they stated that the bench is not in existence and then they said that we have brought no changes to the bench. Therefore what they are basically saying is that bench not being in existence is not a change. We were unable to comprehend what they were saying”. Abdulla told reporters that in response to this, Nasheed’s legal team stated that the reason Nasheed had lodged cases in court against the JSC is because the commission insists it has powers to assemble court benches. Nasheed’s legal team member Hisan Hussain stated that the reason the JSC is saying the bench does not exist is because magistrates who were initially appointed to the bench have now been promoted to superior courts. “We must always assume that the JSC will assemble a bench, possibly even tomorrow and proceed with the case as long as the commission insists it has authority to do so,” she continued. The judge will decide and rule on the stay order request in the next hearing to be held Saturday (February 14) . While the trial continued supporters of Nasheed and the MDP gathered outside the Civil Court and expressed their discontent over the government’s “persecution and failures”. Tensions between Special Operations police officers and those gathered grew as police started clearing the crowd from the main entrance of the civil court around 5pm. Some pushing and shoving was observed along with heated exchanges of words between protesters and the police, although no arrests were made. Former President Mohamed Nasheed’s legal team have requested that the appointment of new judges to the vacant positions on the Hulhumalé Magistrate Court bench be halted. The stay order was submitted at today’s High Court hearing in Nasheed’s case against the Judicial Services Commission (JSC) over the legality of the appointment process to the magistrates court. Despite Nasheed’s representatives insisting that the court consider the request during the hearing, presiding judges asked that it be submitted in writing, saying that the court will deliberate on the issue in a timely manner. Responding to the request, JSC lawyer Hussain Ibrahim said he was unable to respond as he was unaware that the process of appointing new judges to the Hulhumalé Magistrate Court bench was underway. Nasheed’s lawyers attempted to add new points to the original case, but the judges again asked that the new point to be submitted in writing, in spite of further protests. “This hearing will only take arguments from both sides regarding the procedural issue raised by JSC. We will only allow this trial to be conducted as scheduled”, stated Abbas Shareef, the presiding judge. The case was first raised in 2012, and challenges the legality of the bench, which was assembled to try the opposition leader for the detention of Criminal Court Judge Abdulla Mohamed during his presidency. The JSC lawyer stated that he had no points to add to the arguments made prior to the case’s suspension in April 2013. These included claims that the Hulhumalé bench had been appointed on the orders of the Supreme Court, meaning that the High Court could not deliberate on the decision. Ahmed Abdulla, member of Nasheed’s team, noted that the letter regarding the appointment of the bench was sent by the Supreme Court in the capacity of the Judicial Council, despite it having been written under a Supreme Court letterhead. Therefore Nasheed’s lawyers contested that the decision cannot be interpreted as a Supreme Court ruling but must be regarded “an administrative decision by an administrative body”, which would enable the High Court to deliberate on its legality. The Judicial Council was created under the 2010 Judicature Act to oversee administration of the courts, but its duties were soon absorbed by the Supreme Court in what has been described as a centralising of judicial power. Hisaan Hussain and Abdulla Shairu also spoke on behalf of Nasheed today, while Hassan Latheef also represented the Maldivian Democratic Party (MDP) leader in court. The hearing was concluded after a brief statement by Nasheed in which he requested that the High Court grant him the permission to travel freely during the period in between hearings. Nasheed also expressed his hope that the court had not expedited his case because “we are moving towards the shade of the new penal code, which does not include the article under which I have been charged”. The presiding judge ended the session with the announcement that a hearing will be held next week in which the court will deliver its verdict on the procedural issues raised by the JSC, explaining to Nasheed that he will be granted permission to leave Malé after making requests in writing. The MDP yesterday described Nasheed’s trial as the government’s attempt to eliminate President Abdulla Yameen’s political opponents and to prevent them from contesting in the 2018 presidential elections. High Court judge Yoosuf Hussain has retired today, with sources close to the court telling Minivan News the decision was made on grounds of ill-health. According to a statement on the court’s website in Dhivehi, Judge Yoosuf served on the bench of the interim Supreme Court between 2008 and 2010, before being appointed to the High Court. He had previously served as the chief judge at the Family Court, as a judge at Court No.1, and and as a legal officer of the now-defunct Ministry of Justice and Islamic Affairs. Although this is the first time a High Court judge has retired, Ahmed Shareef – initially appointed as the court’s chief judge – was demoted to the Juvenile Court in August 2014 by the Judicial Service Commission.